In A Venetian Canal with Gondolas, Aldine has used his bold colour palette to recreate the feeling of the hot sun reflecting against the architecture and waterways of Venice. The artist was born at St. Jean de Bournay in L’Isere. He trained as an architect and studied art and architecture under Constance-Dufeus at the Ecole des Beaux Arts in Paris. Bouvard became the Director of Architectural Services for the Seine and was responsible for the construction in Paris of the Bourse du Travail and also for the Boulevard Morland. On one of his numerous painting trips to Venice he met the noted Venetian artist Felix Ziem, the man who greatly influenced his work for the remainder of his life. Bouvard also worked under the pseudonym of Marc Aldine, allowing him further success through alternative markets for his work. Venice had always been a popular venue for visitors on the Grand Tour throughout the eighteenth and nineteenth century and with the development of the European rail network in the latter part of the nineteenth century, Venice attracted visitors in even greater numbers. This trend was to continue throughout the twentieth century, extending the market for Bouvard’s work. 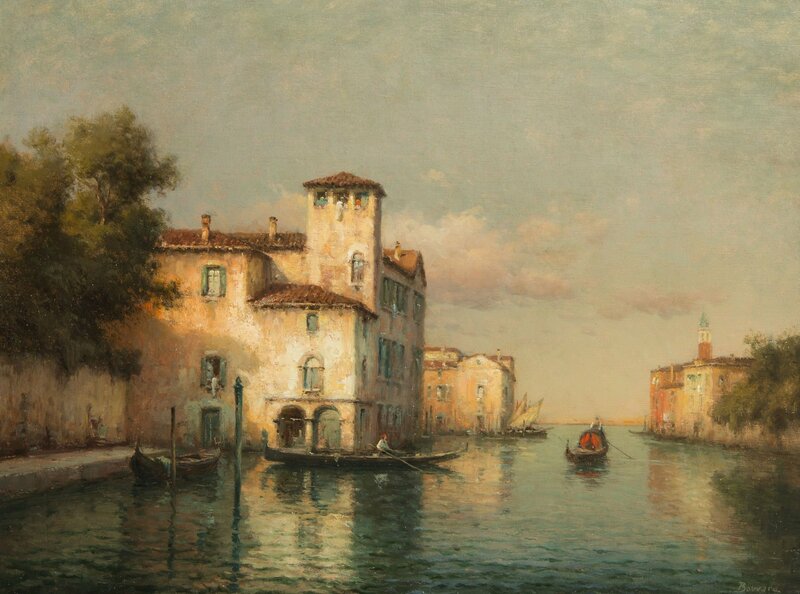 Antoine Bouvard became very popular to his sensitive understanding of Venice. Not only did he capture the activity and glamour of well-known scenes like the Grand Canal and the Santa Maria Della Salute but he also caught the atmosphere and serenity of the backwaters. His paintings demonstrate his architectural skill whilst reflecting his love of Venice’s unique light effects.